Klaus is loved and adored by Eric and his family; he is almost considered the third child, but like all animals (and humans for that matter) he has some, not so lovable habits. 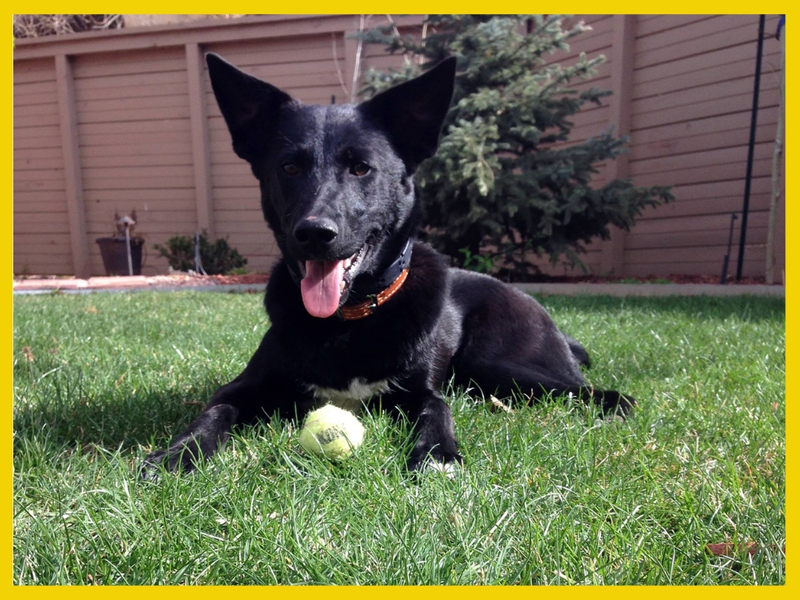 Klaus is a sturdy ‘unit’ of a dog and keeping him fit and healthy is one of Eric’s main goals. Rather than canned dog food or dried kibble, Eric feeds him a raw diet; raw poultry, red meat, organs, bones and veggies – lucky dog! Most dogs eat from a bowl but not Klaus - he likes to drag the meat out of the bowl and devour it off the floor which, as you can imagine leaves a bit of a mess. To try and minimise this, Eric took to feeding Klaus in his crate which has a plastic liner that has to cleaned every day. Up until now, Eric has been using ‘409 lemon all-purpose cleaner’ to wash down the crate to kill the bacteria left from the raw meat, why? Eric wanted to prevent the spread or accumulation of bacteria and like most people, assumed a disnfectant like 409 would be the best choice for the job. Our desire to use the 'best' or 'strongest' chemicals comes from a place of wanting to keep our families and loved ones safe from bacteria and illness, but sometimes we don't think about the potential side effects of chemicals and whether safer alternatives exist. Is there a build-up of chemicals with regular use of disinfectants? How do disinfectants affect my dog? 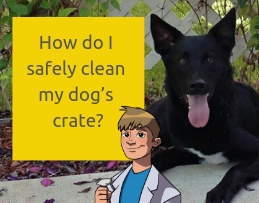 Is my dog ingesting chemicals when I clean his crate? Are the chemicals from disinfectants dangerous to my pregnant wife? Can the chemicals from disinfectant be having an effect on my young son? What safe cleaning alternatives are available? These concerns are understandable, Eric has gotten to the stage where he is fearful for his dog’s health with the continued use of chemicals in his crate. We want to be able to help Eric and shed some light on the situation he is in, to allow Eric and his family to find a non-toxic cleaning solution and to make the right choice for Klaus. 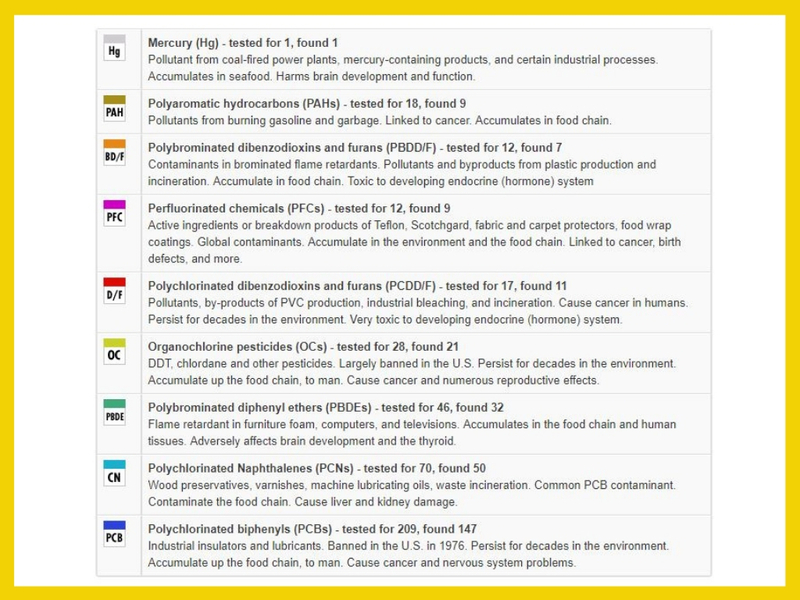 We are exposed to toxins each and every day from the food we eat, to the air we breathe and the products we use. Scary thought; before we are even born, the toxins are already in our blood. Through the natural progression of life, toxins build up in our bodies which lead to a large number of diseases and sickness. The same can be said of domestic animals. Dogs sleep on floors, walk on surfaces cleaned with disinfectants, eat food containing additives and inhale the products we use in our homes. Bleach can be extremely harmful to dogs and can result in severe lesions on the skin, or in lesser cases, skin irritation. If ingested toxicity could result in complications within the digestive and respiratory systems. How does bleach effect my dog? You will remember I mentioned that Eric is using ‘409 lemon all-purpose cleaner’ in Klaus’s crate? One of the ingredients in 409 that may be cause for concern is Lauramine oxide which can be found is some washing up liquids. If exposed, lauramine oxide dissolves the lipids in skin. Lipids are skins natural fat which keeps the skin health, locks in moisture and creates a barrier for dirt. When these lipids are dissolved the skin can become, dry, flaky or cracked. Another significant ingredient in 409 lemon all-purpose cleaner is dimethyl benzyl ammonium chloride or Benzalkonium chloride. Benzalkonium chloride is used in many products such eye drops, hand sanitisers, Dettol, spermicidal creams, inhalers and surface disinfectants. Leukocyte responses to local inflammation – Leukocytes help fight infection and play an important role in the body’s immune system. Most disinfectants contain chemicals that are deemed as a biocide. A biocide destroys or renders harmless, harmful organisms e.g. bacteria, viruses and fungi at the point of contact. They are designed to continue killing on surfaces after application. As such, these residues will exist after cleaning. Unless the surface is washed down with water after being cleaned, there will chemicals on the surface with the risk of them being ingested by Klaus when he is eating his dinner. We mentioned earlier that the average new-born baby has 287 known toxins in his or her umbilical cord blood. There was a benchmark study* carried out by EWG to establish the levels of industrial chemicals, pollutants and pesticides in umbilical cord blood, the dangers of pre- or post-natal exposure to this complex mixture of carcinogens, developmental toxins and neurotoxins have never been studied. Children and babies in the womb are more susceptible to the harmful effects of chemicals because their metabolism works faster, taking on board more air, water and fluid that a fully grown adult. Previously, we have been taught that cleaning, disinfecting and sanitising was essential to prevent the spread of infection and ensure clean, safe surroundings. This much is true however, emerging evidence is highlighting that the effects of these strong disinfectants are having an adverse effect on humans, animals and the environment. We found this interesting article surrounding non-toxic cleaning in an early learning environment and why it is critical. My dog crate smells, what non-toxic cleaning products are available? There are several Eco-friendly options available on the market in the UK however, Eric and his family live in the USA. One product that we are familiar with that is available in both countreis is Method. Method Eco-friendly cleaning products - where can I buy? Is there a natural alternative for killing bacteria? Cleaning products don't always have to be shop bought. More often than not surfaces can be wiped down with hot soapy water to keep them clean and safe. In the case of Klaus and his meaty mess, well, he need a little extra 'cleaning' to make sure there is no cross contamination from the raw meats. Vinegar (malt or white) has been used for 100's of years to kill bacteria. The acid (acetic acid) in vinegar has been proven to kill bacteria and viruses, by chemically changing the proteins and fats that make up these nasties and destroying their cell structures. Along with natural remedies, there needs to be reliable and effective products on the market to kill harmful bacteria and viruses. Does this mean that the health of our families and pets have to suffer? It is our mission is to keep you and the environment clean, healthy and safe and now that Eric has more information on 409 lemon all-purpose cleaner, we hope it will allow him to make an informed decision. Wait, what about beautiful Klaus? I don't know about you but I have not seen a dog like Klaus here is Scotland, he is a cracker! Did you know that Canaan dogs are thought to be the oldest dog breed in the world? Dating back to times before the bible was created and being depicted as man’s best friend in 4000 year old tomb paintings. Humans are habitual creatures; it is easier to carry on using products that have been part of their lives for years. It sometimes takes a drastic incident to cause us humans to change. Why? If we know something is bad for us, harmful to our family and not allowing us to be the best version of ourselves that we can be why is it so hard to change? How does cleaning with bleach effect my dog?